Who Is Lying About The Buk Missiles That Took Down MH17 Over Ukraine? The only thing we know for sure is that somebody pressed a button. Here's what Russia, Ukraine and America are saying about the radar-guided surface to air missiles that killed 298 civilians. Someone is lying. Pro-Russian rebels claim they got a Buk SAM, but it doesn't work. Pro-Russian rebels report they fixed the system and it's now operational. 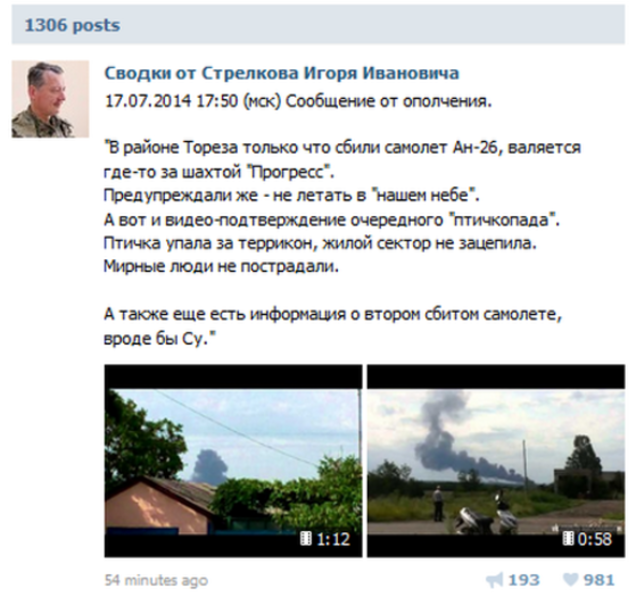 Pro-Russian rebels proudly report they shot down a Ukrainian cargo plane. Malaysia Airlines MH17, a civilian Boeing 777 gets shot down. Pro-Russian rebels claim they don't have Buk missiles after all. The Ukrainian press reports that the rebels hit a Ukrainian squad, and that's how they got the rockets. The Ukrainian authorities deny losing any of their Buk missiles to the rebels. A mysterious truck carrying a mysterious cargo is leaving Ukraine towards Russia. The Pentagon and John Kerry blames Russia for suppling the weapons to the rebels. Today, Russia once again denies any involvement. They also go further, claiming not only that that did not supply weapons to anybody, but also that the Malaysian plane was shot down by a Ukrainian fighter plane while the Ukrainians also had 4 Buk missiles in the region at the time. Russia also questions the involvement of a U.S. satellite. That's where we stand right now, with some suspecting Russia will start a war soon after Putin called together The Security Council of the Russian Federation. Meanwhile, Ukrainians claim the rebels are now shooting at Russia in order to have an excuse for an attack. Somebody is clearly lying. The plane was shot down, and it was shot down by SAM missiles. But who is it? From where I'm sitting, 200 miles from the Ukrainian border, I would bet on Putin's crew missing a few missiles. Also, shrapnel damage supports the Buk missile theory. In other, totally confirmed news, the United Nations can't do much about Russia even if they are responsible for the tragedy, since Russia has veto power in the Security Council. That's the beauty of the international community, right there.